Vampire Beauties: Vampiress Review: "Beautiful Vampire"
The Gist: A vampire who works as a makeup artist has trouble controlling her bloodlust around her landlords son. Female Vampire Factor: Ran (Jung Yeon-Joo) is a 500 year old vampire who lives life as a makeup artist. One day a young man comes to her shop in need of getting makeup done for an audition as he is an inspiring actor. When Ran gets close to him the scent of his blood reminds her of someone from her past resulting in her losing control. The first time they meet she almost bites him but her landlord comes in just in time though she believes (as does he) that her intentions were to make a move on him and not drink his blood. The landlord doesn't like this and her and Ran make a deal that if she stays away from her son she'll get a discount on her rent. This is easier said than done as he develops feelings for her and won't leave her alone and it becomes harder and harder for her to resist his sent. 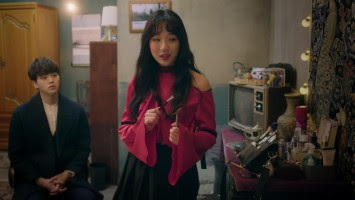 Final Opinion: The "well rounded female vampire obsessed with the human that she needs to avoid that leads to weird interactions" romcom is something that is pretty common place in Asian film and TV and this film doesn't add anything new to it. This is definitely more romance comedy than it is horror which in all honesty this has zero horror elements. Ran does not show fangs in the film and there is only one bite scene. I give it a Vampire Beauty Rating of 1 out of 5. Beautiful Vampire - Korean Movie - Main Trailer from HanCinema on Vimeo.